You can read part one here. I have suffered from eczema my whole life and although the severity of it changes, I am always either trying to manage it or trying to prevent it from flaring up. 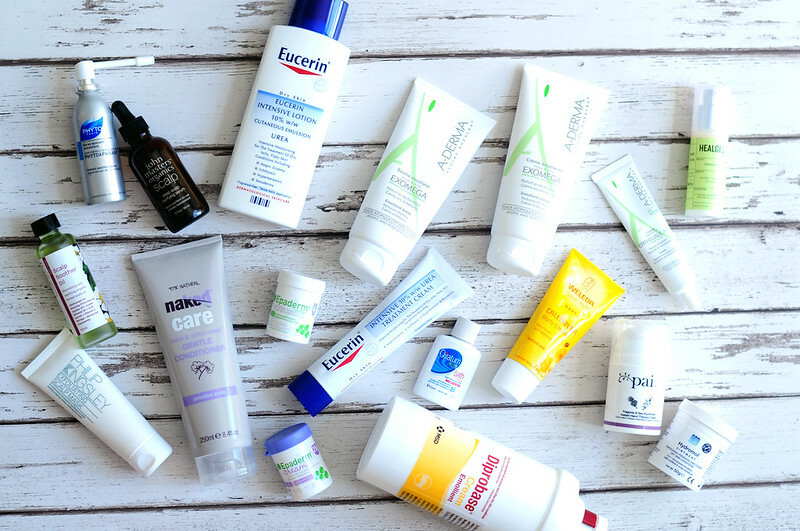 I have a couple of prescription creams from my doctor which I reach for as a last resort, but I've been trying to find alternatives to these as I'm sure it's not good for my skin and health to use these on a long term basis. I have a theory that my eczema works in seven-year cycles and 2015 is the seventh year so I have everything crossed that by December my eczema might be gone, at least until 2022. Here is a list of products that I find work particularly well for my eczema. Oilatum Junior Bath Additive | £9.19 // I've used this stuff since I was little and it's an essential for when my eczema flares up. I have no idea if there's a difference between the Junior or adult version, but I just buy whichever is in stock. It just happened that only the junior bath additive was available in Boots when I last bought it. I also have these mini bottles that I can refill which is perfect for when I travel and want to bring it with me. You just add a capful to running water and it emulsifies creating a soothing milky bath. I tend to just soak for ten minutes or so and then pat myself dry. My skin always feels better after I use this. Aveeno Bath & Shower Oil | £8.49 // This is another one I've used for years and I really need to buy a new bottle. Not only does it smell amazing, but it feels incredible on the skin. It starts off as a shower gel, but emulsifies into a milk when it touches water. Your skin is left feeling like you've just applied an oil, but have only applied what is essentially a shower gel. A must have! Aveeno Shower Gel | £9.19 // This has the same scent as the Bath & Shower Oil, but is more like a normal shower gel. I like to use this during the week when I'm trying to give my skin a break from other bath products as it's very gentle on my skin. It comes in a giant bottle and lasts a really long time. Weleda Baby Calendula Moisturising Body Cream | £7.95 // This is one I tend to reach for in the winter when my skin is even drier as it can feel slightly oil on the skin. It sinks in eventually, but it does take a while. I find this not only moisturisers my skin, but the calendula really helps to soothe my eczema. It's one of the ingredients I look out for when my skin is acting up. I also mentioned the face version of this in my last eczema post. A-Derma Exomega Emollient Cream | £10.50 // This moisturiser feels a lot lighter on the skin so I can use it all year round. This is one of my favourites as it doesn't have a scent so it doesn't irritate my skin, but also it doesn't interfere with perfume if I apply it in the morning. It's just a moisturiser which is all I want especially when it comes to eczema. It also sinks in really quickly, but still leaves a slight layer on your skin so you feel hydrated throughout the whole day. I don't use this in incredibly hot weather as I hate the feeling of anything on my skin, but with the weather we get in the UK it's fine. I've been really impressed with all the A-Derma products I've tried and it's a brand I'll use for a long time. A-Derma Exomega Emollient Balm | £13 // Although this is described as a balm, I think it's just a heavier cream. It doesn't feel like any of the other balms I have and use. I tend to use this in the winter and on my elbows and any other very dry areas throughout the rest of the year. It has all of the same properties as the cream, just in a heavier formula. This isn't an essential, but it's nice to have. Kate Somerville Eczema Therapy Cream | $48 // This has to be my favourite body moisturiser I've ever tried and that's saying something as I've tried a lot. It's also very expensive and I went through the whole tube incredibly quickly. It contains oats which really helps to soothe my skin and eczema and it just makes my skin feel amazing once it has sunk in. I haven't bought a new tube since finishing it, but I do miss having it to hand when I need it. A repurchase is on the cards, but I'd quite like to finish a few more products first. I might add it to my Christmas list. Healgel Intensive | £37.50 // This is another expensive one, but again I really notice a difference when I use this and when I don't use it. I bought this to use on areas of my skin that are slightly scared thanks to years of scratching my eczema in my sleep. It was designed to be used post-surgery to help scars heal. I scar pretty badly even with the smallest of cuts and you can really see how the texture of the skin on my hands have changed since my eczema flared up again in 2008. I also use it as a sort of spot treatment for those pesky scars left behind from under the skin spots. It acts as an intensive moisturiser so it works really well to heal spots and prevents scars from forming. After using this for a good six months or so, I can tell a difference in the texture of my skin as it looks slightly smoother. It's a handy multi-purpose product to keep around for accidental curling tong burns (I can't be the only one!) and even to use on sunburn as an intensive treatment. The packaging means you can really control how much product you're using and you can also see how much is left which is always a bonus. It has a gel texture and feels quite cooling when you apply it which makes me think it would be amazing on sunburn. Pai Fragonia & Seabuckthorn Hand Cream | £16 // I haven't used this hand cream in a while as I'd forgotten I even had it. That's a sign I have way too many products! I've started using it again each night before bed and it's helped decrease the amount of flare ups I get on my hands. I probably wouldn't buy it again though as it's quite expensive and I go through hand cream quite quickly. Instead I'll probably stick with The Body Shop Hemp Hand Protector which is quite cheap if you can get it with a discount code. Eucerin Intensive Lotion 10% w/w Cutaneous Emulsion Urea £13.50 & Treatment Cream £12.50 // These two are pretty new to my eczema products and I'm still testing them out. I thought I'd share them though and see if anyone else has tried them. Both protect and moisturise extremely dry skin, they just have different formulas. Diprobase Emolient Cream £4.99 // This is my bog standard no frills moisturiser I use when my eczema is particuarly bad. I have the giant bottles that cost around £10 which seem to last a lifetime in my bathroom and bedroom so I always have it to hand. Epaderm Ointment | £6.79 // I really like this oinment and can see it being a life saver in the winter when my hands start to crack because of the cold weather and the central heating. Once I've finished this mini tub the I'll be buying the full size. This really helps to soothe my skin and acts as a barrier against the outside world. It can also double up as a cleanser which I might try out in the winter when my skin is at it's driest. Epaderm Cream | £12.20 // This is very much like Diprobase and once I've finished the mini tub I probably won't buy the full size as there is no need. It's a simple moisturiser that works. Hydramol Ointment // This is another variation on the Epaderm Ointment, but I think it's a bit harder to find. Both work in the exact same way though so pick which ever you can find. A-Derma Epithéliale A.H. Cream | £6.25 // This is another life saver product and one I cannot be without. I'm even thinking I might need to buy a few more tubes so I can have one in the bathroom, one in my handbag and one at work. If you suffer with eczema on your face or just sensitive skin that is irritated easily then you need to try this. I cannot rave about it enough as it has completely changed my ski. Whenever I feel a tiny part of my face being iritated then I apply a layer of this and it instantly calms down. I don't use it everyday if my skin is feeling ok as I don't want my skin to get used to it and it stops working. I have no idea what it is about this cream, but it really helps my eczema especially around my eyes. Phyto Phytoapaisant Instant Soothing Spray // I tend to use this during the week when my scalp is feeling itchy, but I don't want to wash my hair. A few sprays of this throughout my hair and it helps to relieve the itching. It's also quite cooling which helps to soothe my scalp as well. The great thing about this is that you can't see it in your hair after you've used it. It looks like it's sold out everywhere at the moment so I hope this doesn't mean it's been discontinued! John Masters Organics Scalp Deep Scalp Purifying Serum | £23 // This is one that you could get away with using before going anywhere as it almost disappears once it has sunk in and dried, especially if you only apply a small amount. You might need a helping hand to apply it as it's hard to separate your hair and apply it at the same time. It has a mint scent which I love but does remind me of the dentist. The pipette makes it really easy to use and control how much product you're using. It isn't as effective as the Philip Kingsley Scalp Mask, but it's one I always reach for and I will be buying another bottle when I finish this one. Fushi Scalp Soother Oil | £20.50 // I haven't used this one too many times as it's a bit messy, but if you fancy staying in one evening and just putting on a film so it doesnt matter that your hair looks and is covered in oil then it's a good one. Quite a few of the other scalp treatments I have, you could actually go out after you've applied it, but this is definitely not one of them. It works better at getting rid of a dry scalp rather than eczema so it's not one I'd ureach for if my scalp was feeling irritated. I probably use this more in the winter. I do wish they would redesign the bottle into something more practical. Philip Kingsley Exfoliating Scalp Mask | £8 for 20ml or £17 for 75ml // This is one of the first scalp products I tied and is probably my favourite. I've no idea if it is actually exfoliating my scalp, but all I know is that my scalp always feels better after I use this. It doesn't get itchy for a ood length of time before I next have to wash it. You do have to wet your hair before you apply this one so is another one to stay in while you're using it. I tend to apply the Philip Kingsley Eleasticizer at the same time as you have to wet your hair first when you use it so it kills two birds with one stone. Naked Gentle Conditioner // I sort of don't want to even talk about this conditioner as the brand Naked is no more, but it is amazing if you can get hold of it as it has worked wonders for me. My face is irritated by certain conditioners and I haven't had any problems with this one. It also works a treat at keeping my hair feeling and looking soft and shiny. I would just like to add, these products work for me and although I hope they could work for you, everyone's skin is different especially when it comes to a skin conditioner like eczema. Are there any products you think I'm missing? What's your favourite product to help with eczema? Your first eczema post was so helpful so I was super excited to see you've done a part 2 as my eczema flared up quite badly over a year ago but is now much more manageable and has calmed down. In the winter I love using the La Roche Posay Lipkar Baume AP on parts of my face and body that get particularly bad; it's a super thick cream but works well to moisturise and ease the irritation. Dermol 500 lotion is great to use as a shower gel and I use doublebase gel as my everyday moisturiser. You must use some mild skin care products, so as not to cause more skin irritation.